Bloddy maria with bourbon candied bacon! 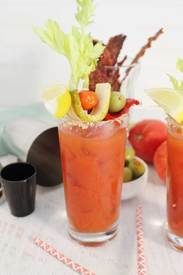 This Bloody Maria from 2 Cookin Mamas is a spicy variation of the classic Bloody Mary with a little Mexican twist on it. Just substitute tequila for the normal vodka and you’ve got what is commonly referred to as a Bloody Maria. It is the garnishes that take this cocktail over-the-top! Celery, pickles, cherry tomatoes, olives, roasted red peppers, lemon slices, and the real showstopper – Bourbon Candied Bacon!